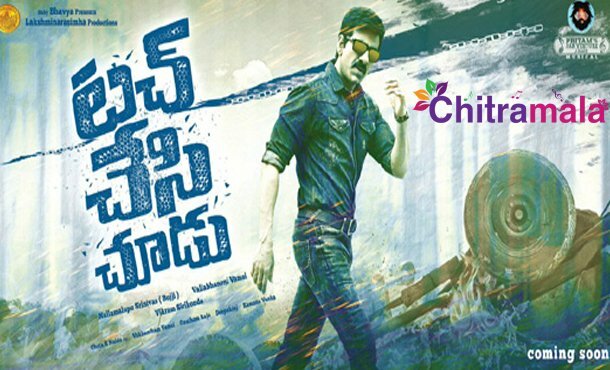 Mass Maharaja Ravi Teja’s new movie Touch Chesi Chudu first look poster released today. Raviteja looks stunning in the poster and filmmakers planning to release for Pongal, 2018. Actresses Rashi Khanna and Seerat Kapoor playing the female lead roles opposite Raviteja in this flick. Ravi Teja is playing the role of a police officer, and it is being directed by Vikram Sirikonda. Nallamalapu Srinivas and Vallabhaneni Vamsi are jointly producing this movie. Apart from this movie, Ravi Teja will also act in a new movie to be directed by Kalyan Krishna and the film title “Nela Ticket” is under consideration. Malavika Sharma is playing the female lead in this flick and Jagapathi Babu will be seen in a negative role.